My favourite aspect of beauty blogging, is sampling products from brands that wouldn't necessarily catch my eye when shopping. I admit - I always gravitate towards the usual suspects and big beauty names when looking for something new. 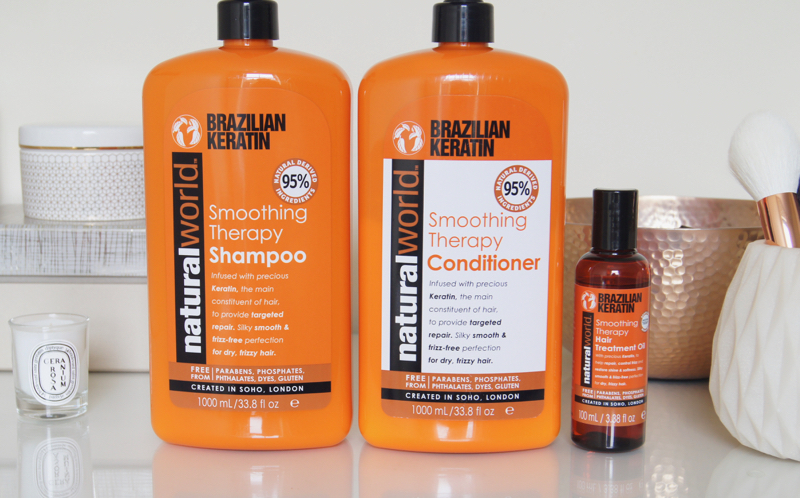 So, when I was contacted by Natural World to see whether I'd like to try their Brazilian Keratin range, I was half intrigued and half dubious about how the products would perform, seeing as I'd never heard of the brand. Honestly, I have never been so surprised by a haircare range in all my life. With this review, you'll really want to read the whole post! 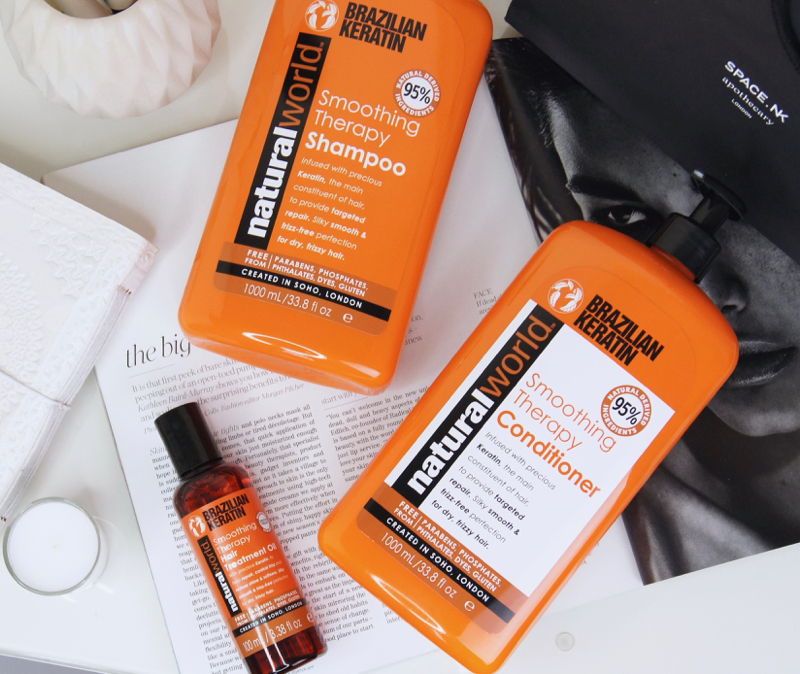 I received three products from Natural World's Brazilian Keratin range, including the Smoothing Therapy Shampoo, Conditioner and Hair Treatment Oil. All of the products within this line contain 95% naturally-derived ingredients and are infused with Keratin. They're also free from a whole host of potentially harmful ingredients, including parabens. Aimed at those with dry, damaged hair, this range sounded ideal for me. My barnet can be a bit of a nightmare - my locks are super long and subjected to a daily beating from heat styling and brushing. Always craving nourishment, it's imperative that I give my hair lots of TLC on a daily basis, to avoid it resembling a tumbleweed and I thought these products could work wonders. By replenishing and repairing damaged keratin bonds on the surface of the hair cuticle, these products should leave it smooth, shiny and frizz-free. But, do they? Like most shampoos, this has a clear gel texture. As it contains a blend of four essential oils, I expected this shampoo to be rich and luxurious, so I was surprised that it felt more like a clarifying formula on first use. To thoroughly cleanse my entire head of hair, I need to use about ten pumps of product to get it to lather into a creamy foam, which is more than I usually require. After rinsing, my hair feels super squeaky clean, which I find quite unusual for a smoothing formula. Often, though, if a shampoo isn't as purifying, then my hair ends up getting greasy more quickly. It's a nice change that the lighter formula helps my roots to stay feeling fresher for longer. Just a quick note - personally, I find both the shampoo and conditioner have a really strong scent to them that I'm not keen on. Fortunately, neither product has caused my scalp any issues and the scent doesn't linger in the hair once dry. Now I'm used to it, it's not a major problem, but the washing process would be a lot more enjoyable if the products contained a nicer fragrance. I'm aware that many in-salon professional keratin treatments tend to smell quite potent (and often make people's eyes water during the process), so maybe the scent of these products is possibly linked to that ingredient, I'm not sure. As I hoped, this conditioner has a creamy consistency, but it's not so overly rich or heavy that it leaves my locks feeling weighed-down or greasy. In fact, after leaving it to soak in for five minutes, I find that there's barely any excess product left to rinse out. 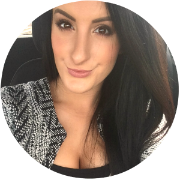 My thirsty hair seems to completely absorb the conditioner and drink up all the moisture, so it only takes seconds to fully wash out. Although it speeds up the chore of hair washing, it doesn't seem to condition at all. Honestly, when I get out of the shower after using this duo, my hair feels like dry straw. Like it's going to be a nightmare of knots and tangles to brush through. After the first use, I just couldn't understand why a haircare duo formulated for dry hair hadn't left it feeling at all healthy. And that's why I've been so surprised by this range. What's so mind-boggling, is that after I brush through, then blow-dry and style my hair, the smoothing effect becomes instantly apparent. I honestly can't believe how sleek, silky soft and shiny it makes my hair look and feel. Even my boyfriend has commented on how much better my hair looks and feels since I've started using this range and I hadn't even told him I'd switched to a different routine. Now, he's obsessed with running his fingers through my hair! What's even more impressive, is that the results seem to get better every time I wash my hair, which is once every three days now (compared to every day before). Although the hair washing process may not be exactly what I'd hoped for, I'm blown away by the results. I know most haircare products help to improve hair quality and finish over time, but no other shampoo and conditioner duos have ever made my hair feel totally transformed in just one use. This oil has a lightweight fluid texture, which evenly distributes through the hair with ease and doesn't leave your hands coated in a greasy mess. Whether I use it on damp, freshly-washed hair or my dry lengths and ends, it leaves my hair really sleek and glossy. As it's such a joy to apply, I often get a bit carried away and use quite a few drops, but it never leaves my hair feeling lank or dirty. My bottle still looks full despite using the oil every day, so it looks like it's going to last for about six months at this rate! From looking at the ingredients list, it does contain silicones, which I know is a bug-bear for a lot of people. Personally, I find silicone-based oils and serums to work well on my hair and, even though they may only artificially improve the look and feel of it on a superficial level, I don't mind. Used in conjunction with the shampoo and conditioner, this treatment makes my hair feel better than ever. Another bonus with this range, is that it's so affordable. Every single product is priced at just £6 or less, even for the larger 1000ml bottles of shampoo and conditioner. That just goes to show that cheaper brands aren't necessarily less effective! Although it'll take me quite a while to polish off the bottles I'm currently using, I'll definitely purchase these products in future. Since discovering the range, I wouldn't want to be without it in my routine! If you're interesting in trying these products, then they're available from Tesco. 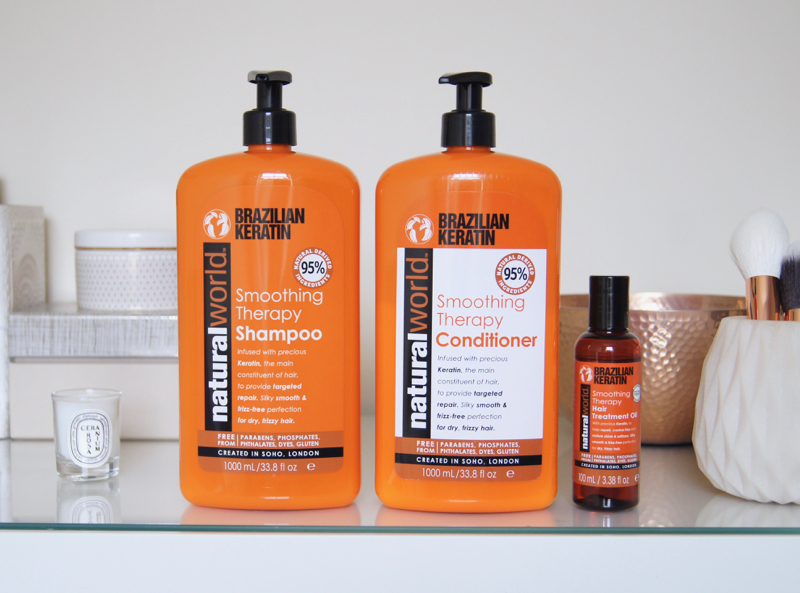 Have you tried the Natural World Brazilian Keratin haircare range? This post is sponsored by Natural World. I absolutely love when hair care products have keratin, my hair always feels softer and smoother. I definitely need to check these bad boys out! Thanks for the review.